The half gallon of Advantage Comes With a Spray Bottle. 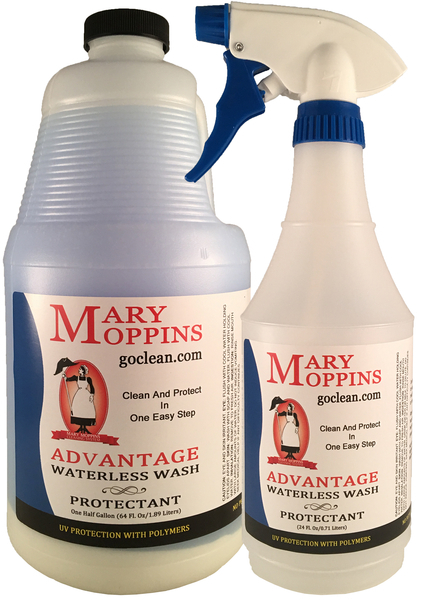 Mary Moppins solved the dilemma of what wax or protectant to use on your RV, boat, airplane, truck or trailer by speaking to paint manufacturing and fiberglass manufacturing companies for RVs and boats. Advantage is specially formulated without petroleum distillates or carnauba wax. The polymers in Advantage leave a show stopping shine while protecting against UV ray damage. Our polymers prevent oxidation even on decals, striping, signs or lettering. They leave the surface slick so bugs and dirt slide right off to make cleaning easy. Advantage contains kaolin clay which helps to remove impurities and bumps in the paint that damage the finish of the clear coat. These are just a few of the amazing uses you will find for Advantage. Always apply to a cool surface and never in the direct sun. 1) Hold the bottle between 4 and 5 inches from the surface. Lightly spray a small area. Fold our Baby Diaper Cloth flat wiping from left to right and right to left* over the sprayed area. Continue wiping to remove impurities (bumps in the paint), light oxidation and films. *Wiping in circles can leave swirl marks. Wipe with the grain of the paint. 2) Allow the area to haze over as you treat a second spot. Then lightly buff with a terry cloth towel to leave a remarkable shine. NOTE: As Advantage is sprayed onto a vehicle, specially selected cleaners dissolve and lift the dirt suspending it in the fluid. *Never use Advantage as a waterless wash with the presence of sand or grit. 1) Clean the shower with CleanEz and allow to dry. Check to make sure all soap scum has been removed. 2) Spray a clean soft cloth with Advantage. *Never spray directly on shower walls as the spray drifts to the floor and makes it slick. 3) Wipe on the wall. Re-spray the cloth as needed. Let Advantage haze over as you treat the second wall. Wipe to remove the powder. 1) Clean the toilet with CleanEz and remove water ring marks with our Erase It for Bathrooms then back the water out of the toilet. 2) Spray only the inside of the bowl with Advantage and wipe to spread evenly. 3) Wait ten minutes, wipe to remove the haze and allow the water to return to the toilet bowl. 1) Clean a cool surface with our Benya and a clean cloth for streak free windows or windshields and allow to dry. 2) Check for streaks (dirt in a cloth can cause smears) spray a small amount of Advantage on a clean soft cloth. Apply, wait until it hazes over then wipe to remove. I wish I had found this years ago! So easy to use for such fantastic results! My motorhome looks like it just came off the lot!